How does suede back feel compared to smooth leather in IWB ? Thread: How does suede back feel compared to smooth leather in IWB ? This is something I have been thinking a lot about. I have no experience here. I typically do not wear an undershirt. I tend to sweat in the summer a good bit. 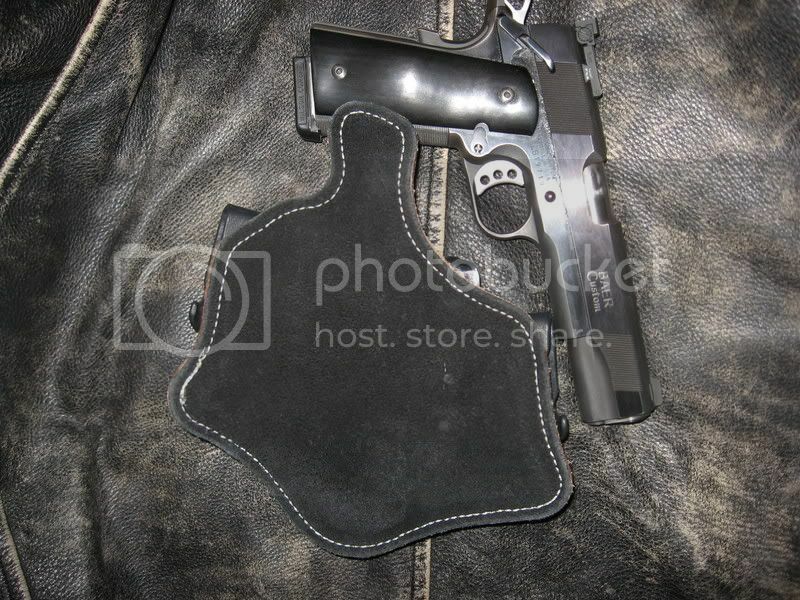 I also want a holster that can be shifted when getting in the car, etc. How do suede backed holsters feel compared to smooth leather ? You actually have three options to consider. You'll find different options on different model holsters. Personally, I prefer the smooth side of the leather over rough out, but I haven't tried suede. www.ubgholsters.com short wait times. Use 'defensivecarry' as a coupon code for a discount to your order. The extra layer is thin, comfortable, and keeps the leather away from one's skin...important, at least for me! I use and like rough out IWB with a under shirt that works for me. "If everyone is thinking alike, then somebody isn't thinking" - George S. Patton. +1 on MNBurl...I always wear a T-Shirt and perfer rough-side out. I like the Suede Back on my K&D Dakota Defender. with or without an undershirt between it and me I find it comfortable. I typically do not wear an undershirt. I tend to sweat in the summer a good bit. I also want a holster that can be shifted when getting in the car, etc. For one of the same reasons I love it, you'd likely hate it. The suede backing holds the holster incredibly firmly and stable in my preferred postition. If you like to shift your holster around, this is NOT for you! You state that you tend to sweat a lot and dont wear t-shirts. Then, avoid roughout. Rough-out is great for the same reasons as suede; offers greater stability. But, roughout also tends to wick moisture into the smooth leather inside and therefore against your pistol's finish. Not good. Suede is superior to rough-out in that it is bonded to the other leather, which bonding helps provide a far less moisture permeable barrier. Good, chrome tanned suede is much more comfortable against the skin than rough-out. Sounds to me like a fully lined, smooth-out model is for you. Proud to be an infidel. Actually, I ordered an In-cognito Deluxe - the suede back primarily because it has a thin plastic moisture barrier which I am hoping helped keep my Sig nice and dry. As an example, in the summer I typically have wet money in my leather wallet which is in my jeans. How to smooth rough leather?